Accent nails have been very popular lately, so I decided to go crazy and dress up my favorite nail polish (Layla Hologram Effect Flash Black) with all sorts of accent nails. 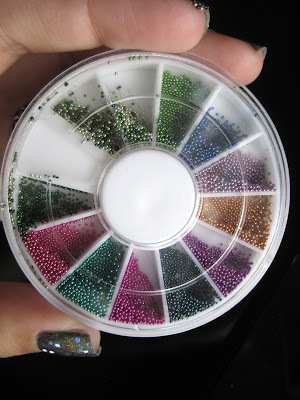 When I got these micro beads from Born Pretty to review, I originally had a full "fish eggs" manicure in mind, but once I got it, I realized that there wasn't enough of each color. I think this wheel of microbeads is more for nail art using the bullion pieces to create patterns like Sammy's manicure inspired by fashion. 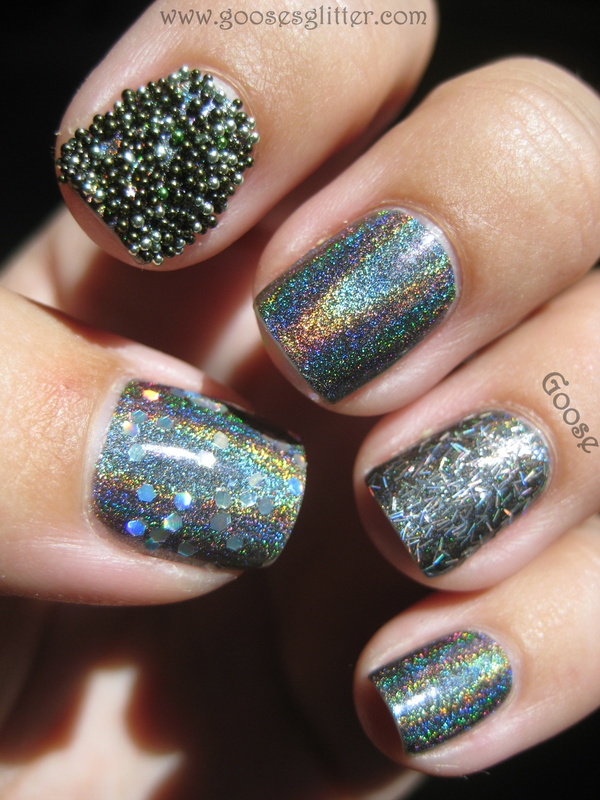 If you're looking to do a full fish egg manicure, I'd probably go with the jars of microbeads instead. The container these came in is a little tricky. Every time I turned the top clear piece to move the opening to a slot of beads, micro beads from all over would stick to it (static cling) and migrate into the other colors. You can see what I mean in the picture below. It makes them a little bit hard to use as solid color accent nails, but I would imagine it'd still be fine for delicate nail art. The Born Pretty microbeads can be purchased from their site as well as a lot of other awesome nail art decorations and polishes and nail wraps! You can also use the code GG5J61 to get a 5% discount on your order! Wow, this is a real "in your face" mani! Looove! This mani is so great! I love how each finger is different. Great job! I love it! But I was wondering, do those beads really stay on your nails? Doesn't seem like it would last very long. this is fun - i like it!